I should begin by first disclaiming that while I'm generally pro-standards, I'm also somewhat agnostic about standards. How can that be? Without going into much detail, I believe (a) what we "count" as mathematics is socially determined and standards documents are just part of that determination, (b) I will never perfectly agree with a standards document, but the amount of agreement should not be underestimated, and (c) if there's any power to standards, it's in how they're implemented -- and "good implementation" is very likely to be seen as just "good teaching" under a different set of standards, or no standards at all. It is with this mindset that I watch with some amusement (and sometimes, disappointment) arguments against the Common Core State Standards because of some poorly designed accountability measure. I'm pretty sure poorly designed accountability measures would be a concern right now regardless of the standards in place. But do the CCSSM call for solving these kinds of equations? I went searching through the CCSSM for all mentions I could find of absolute value, and here's what I found. CCSS.Math.Content.6.NS.C.7b Write, interpret, and explain statements of order for rational numbers in real-world contexts. For example, write –3 oC > –7 oC to express the fact that –3oC is warmer than –7 oC. If all goes according to plan, there shouldn't be a need to define absolute value in 8th or 9th grade algebra, as it will already have been introduced in 6th grade. I know there are concerns about content being "developmentally inappropriate" for lower grade levels in the CCSSM, but without any personal data to the contrary, I imagine students could come to understand absolute value along with understanding positive and negative numbers. The last standard above, from the moment I first saw it, has been a point of fascination for me. How will 6th grade teachers help students learn topics like interquartile range and mean absolute deviation? You need absolute value for mean absolute deviation, but I don't think that will be the hangup for those who struggle with that standard. So where else is absolute value mentioned? Now we have absolute value as it relates to subtraction, and we get another mention of mean absolute deviation in the 7th grade statistics and probability standards. There's nothing yet about solving equations with absolute value or graphing absolute value functions. Nothing. No mention of absolute value or mean absolute deviation. The CCSSM doesn't specify what specifically belongs in 9th grade versus other grades, but here's what I found across the whole of the HS CCSSM standards. CCSS.Math.Content.HSA-REI.D.11 Explain why the x-coordinates of the points where the graphs of the equations y = f(x) and y = g(x) intersect are the solutions of the equation f(x) = g(x); find the solutions approximately, e.g., using technology to graph the functions, make tables of values, or find successive approximations. Include cases where f(x) and/or g(x) are linear, polynomial, rational, absolute value, exponential, and logarithmic functions. The first of the three standards above, I think we can agree, goes well beyond what we'd expect to find in a traditional Algebra 1 class. The other two standards address the graphing of various kinds of functions, and depending on the activity might belong in either a traditional Algebra 1 or Algebra 2 course, or more likely, both. But do you notice what's not there? Solving equations with absolute value functions. Sorry, \( | x - 2 | + 7 = 12 \), but it looks like you didn't get invited to the CCSSM party. Even if you interpret the second standard to include solving absolute value equations, it only asks for an approximation or to use technology. The researcher in me wonders what Algebra 1 teachers will do when they get to a lesson on absolute value. Will some just teach it out of habit? Will some think it was excluded due to a CCSSM oversight? 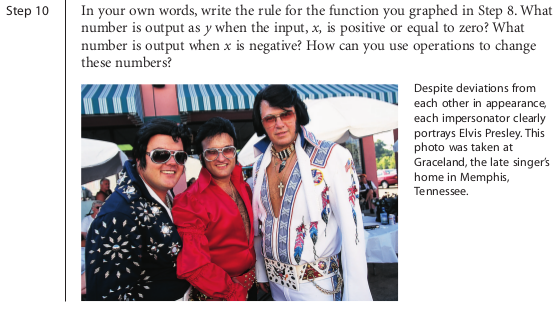 Will some modify the lesson to emphasize the graphing of absolute value, but not solving absolute value equations? How many will not even notice it went missing from the standards? Will anyone be willing to kill the little darling? For years we've lamented math curricula in the United States that was "a mile wide and an inch deep." Given a fixed amount of time, going deeper means going narrower, and there is evidence that the CCSSM supports that (Porter, McMaken, Hwang, & Yang, 2011). For reasons I perceive to be mostly political, the Common Core State Standards don't go out of their way to specifically address content omitted compared to previous standards documents. In 1989, NCTM made a list of areas of emphasis and de-emphasis and many an argument in the math wars was waged using false dichotomies rooted in those lists. I'm sure those who wrote the CCSSM didn't want a repeat of those arguments, so now math teachers and those who support them are left to dig through the standards and find these omissions on their own.